This blog page is chronological, if you wish to look at the most recent post please scroll down. 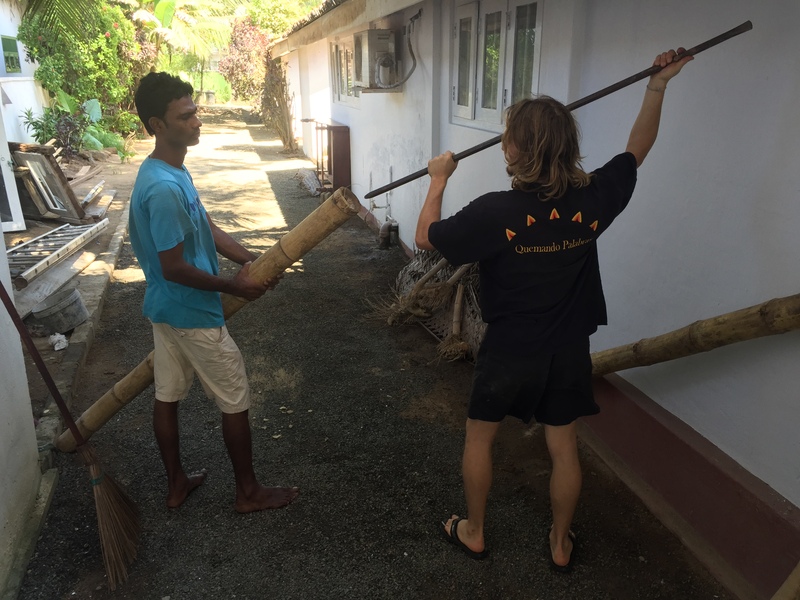 Sura Medura is an international artists’ residence centre in Hikkaduwa, South West Sri Lanka, which has been operated since 2011 by UZ Arts, one of the co-organisers of the IN SITU network. 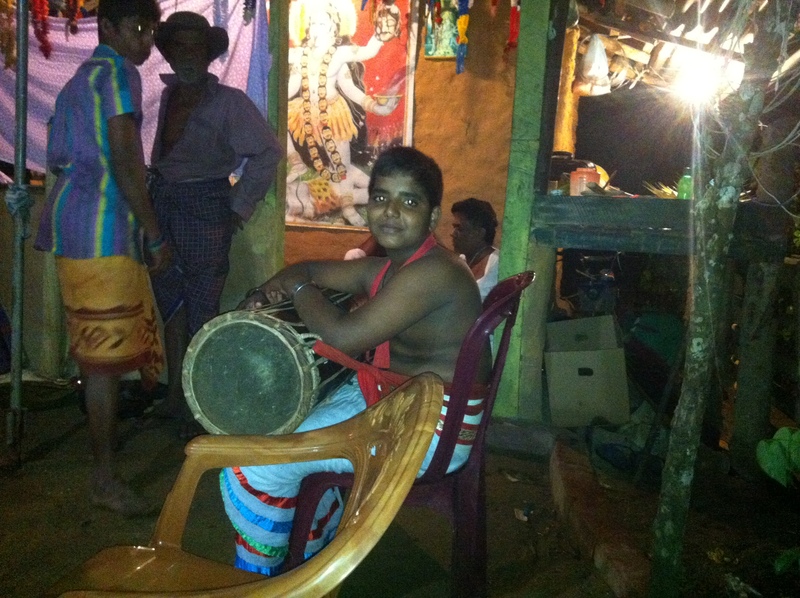 Selected artists are offered mentorship and an opportunity to meet their peers in the Sri Lankan arts community. 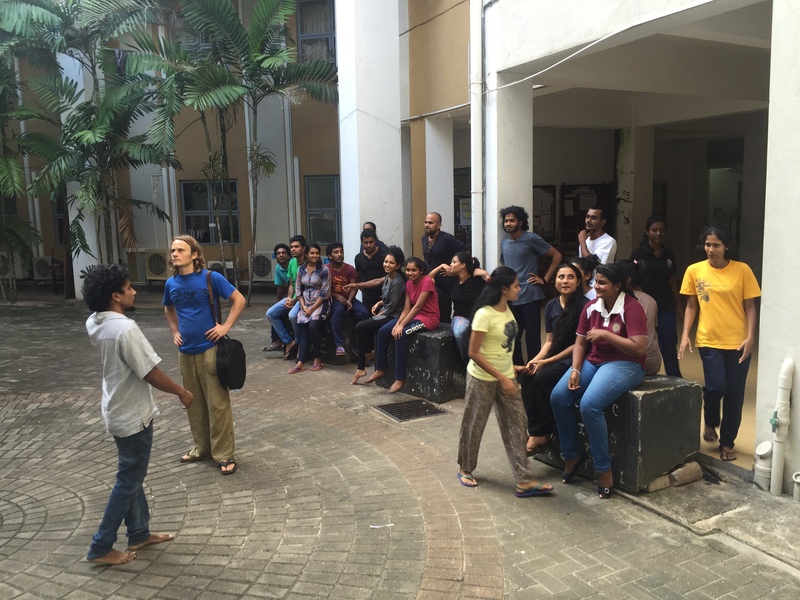 The residency programme supports artists from all disciplines whose work can be enhanced by being in Sri Lanka. 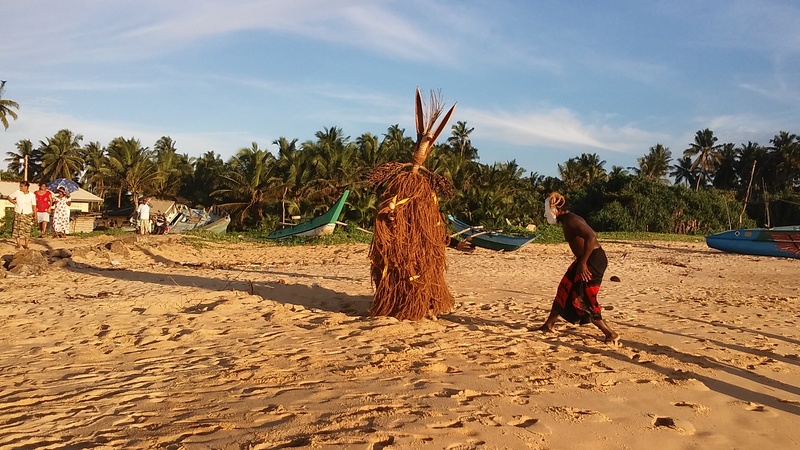 As Sura Medura maintains close contacts with the local population and the national artistic communities, selected artists are encouraged to present their approaches at the beginning of their stay and the fruit of their residency at the end. In order to explore this collaboration process to the full, IN SITU has decided to send a number of European artists to the Sura Medura centre as part of the “European Abroad” programme within the framework of META 2011-2016. The aim is to stimulate new work and develop projects in a non-European cultural context. I’m very happy that I have been invited to this six weeks residency organized by In Situ and UZ Arts. I’d like to thank In Situ and Neil Butler for this wonderful opportunity! One of my favourite ways to get to know a new place is by walking randomly. In this way I get a first taste of the territory and it allows unexpected encounters to happen. The Sun Beach Hotel: that’s where we are living. Beautiful construction with an open garden facing the ocean. Could be a good place to invite people for installation, concert, performance or as central meeting point to take the audience somewhere else. The main street: here there is plenty of little commerce for tourists and hotel entrances, it is also the best place to get smashed by a bus. 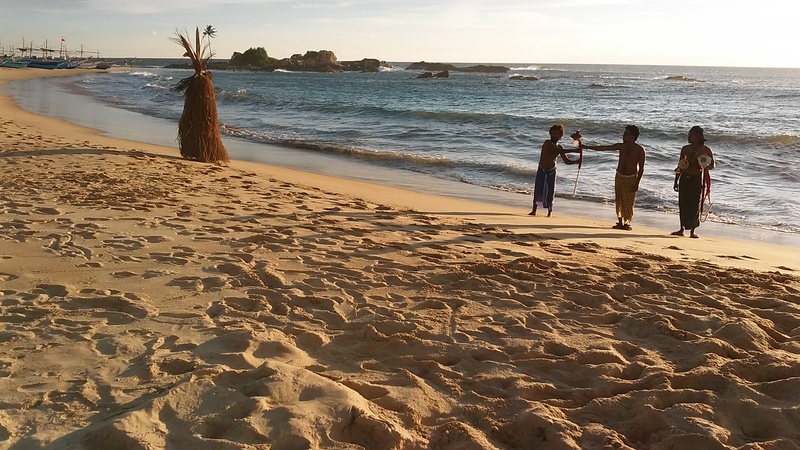 The beach: Incredibly beautiful landscape, populated mainly by tourists and locals working with tourists. After a few kilometres it becomes wilder and the tourists disappear. Even if most of the people are tourists it could be a good place to gather a mix of local and tourist audience, and a wave hurts much less than a bus when it hits you. The jungle: the jungle begins just acros the main road, where you find roads and residential rural areas and villages. It feel definitely more « real » on this side of the main road, but human activity are quite spread so gathering an audience may be difficult. There is a lot to explore on this side, probably best with a motorbike. 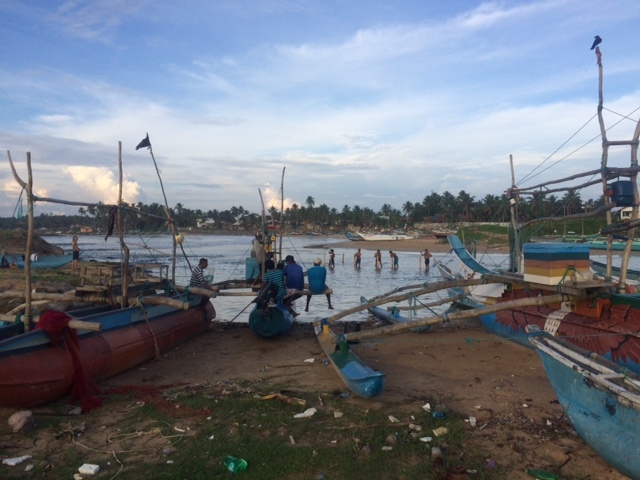 The fisherman village: a very beautiful village between the laguna and the ocean. 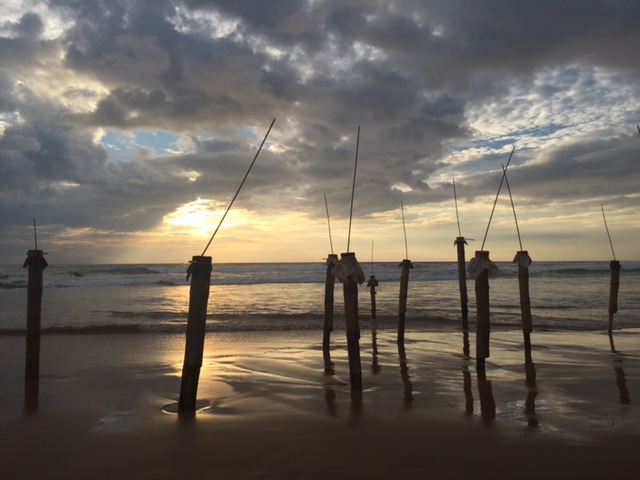 I met a fisherman who invited my to fish tuna with in the open ocean with his small catamaran, at 4 a.m.! This was a very beautiful experience starting in the dark and looking for tuna with 9 fishermans hanging on a wooden structure above the catamaran. I also met a group of women handcrafting ropes with coconut fibre, a very nice natural and cheap material for costumes making. I would really like to perform in this village and collaborate with these people that have been incredibly sweet and welcoming. 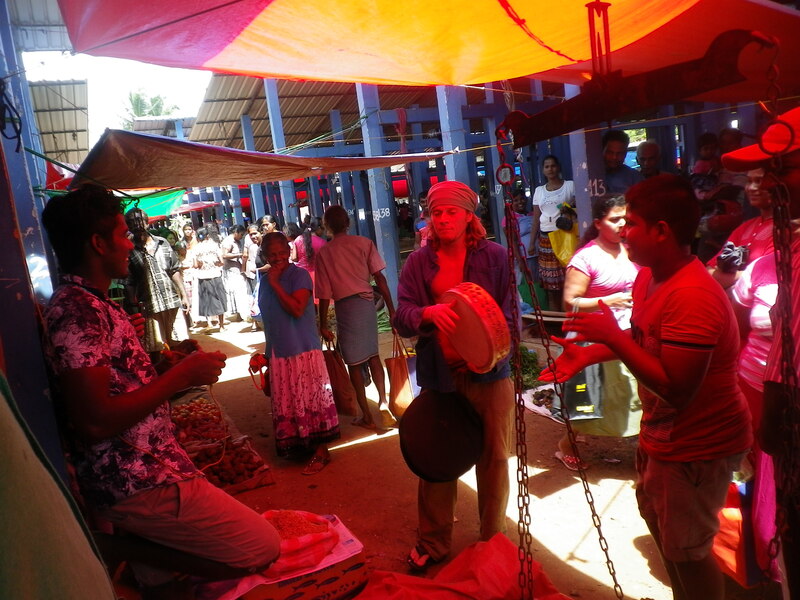 I have been undertaking performative experiments into Sri Lankan public space: performance, games, music and artistic protocols to build playful relationships and let everybody know something unusual is happening. 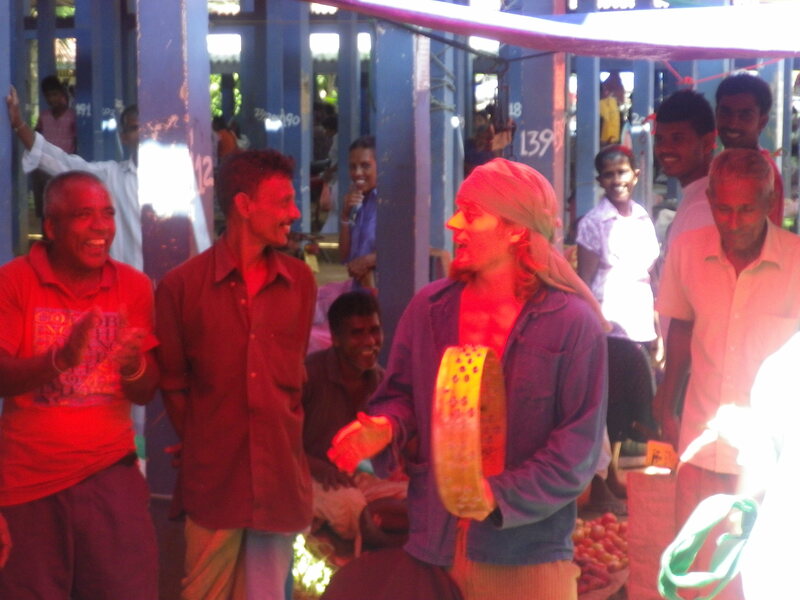 Italian folk music in Hikkadouwa Sunday market. Music is such a great direct universal channel of comunication. 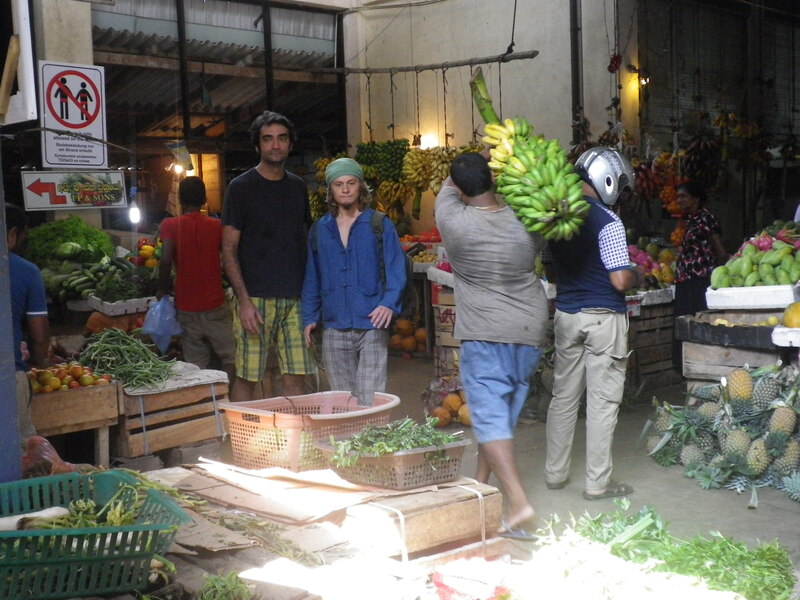 The slowest men in Hikkaduwa: 30 min of slow motion in the fruit market, just enough to buy a marakuya. The construction of ephemeral musical instruments using local natural materials is part of my project. For exmaple my first cupacupa prototype: The cupacupa is a simple friction drum. It’s called cupacupa in the popular music tradition of Puglia (IT), but you can find it in many other traditions: putipu in Napoli, cuica in Brazil, köcsögduda in Hungary, foekepot or rommelpot in the Netherlands, sarronca in Portugal, buhai in Romania, zambomba in Spain, ékue in Cuba, arcusa, bote del diablo or tigrera Mexico and so on, making the tour of the world. That is just one first vision… let’s see how it is going to evolve, especially after meeting the mask and ritual tradition from Sri Lanka! Preparing my departure I contacted Selene Calloni Williams, writer, psychologist, anthropologist who’s been studying and working with shamans, around the world for decades. I had the chance to meet her in Switzerland about 15 years ago and follow some of her courses on those topics. 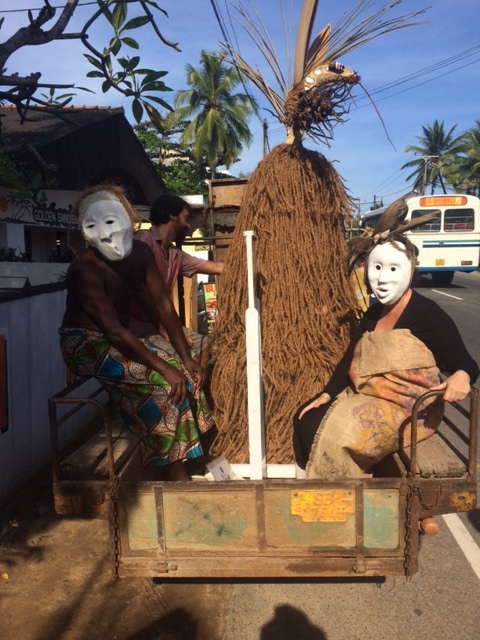 I remember she has been working in Sri Lanka so I asked her to put me in contact with somebody who could help me to find authentic tovils (mask and possession ceremonies). She gave me the phone number of her Sri Lankan friend Nilan, who I met and asked him about tovil. 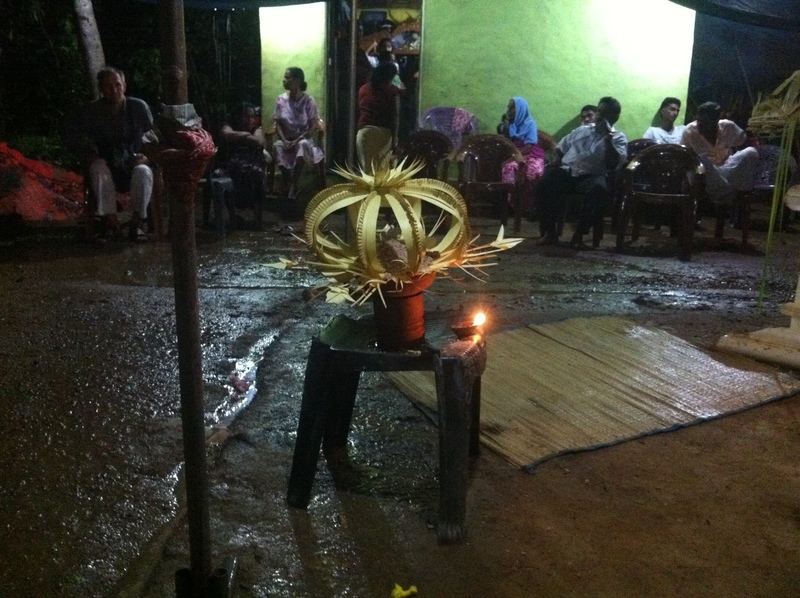 It’s not so easy to find one because those rituals are commissioned by families and performed in their homes. So Nilan started to ask around his network and few days later he told me a tovil was going to happen two days later in Uragaha. 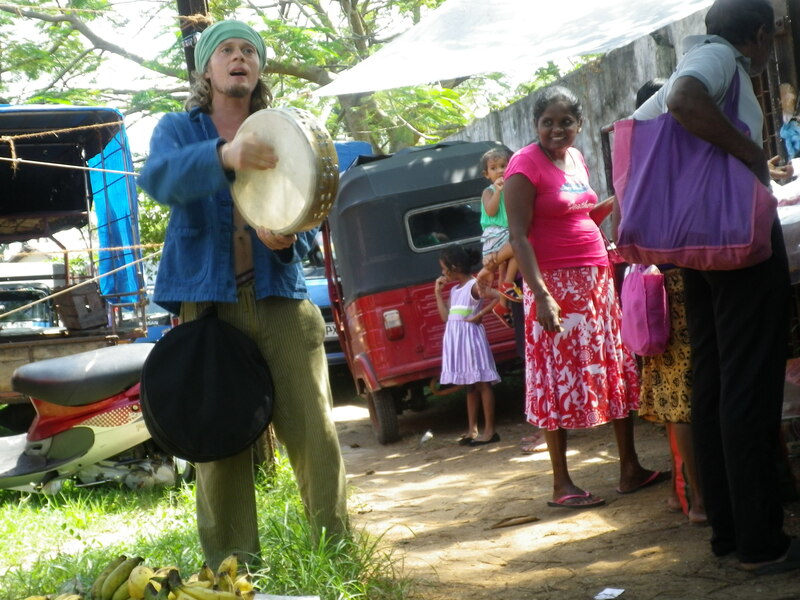 To keep it short I will not write down the quite intricate adventure I went through before finally reaching the house in the jungle where the ritual was taking place. I will just say that luckily I had my frame drum with me and I could let the drunken hero dance (he presented him self as an hero), when he danced, he almost destroyed the house of our host but that was definitely more pleasant then when he would just scream incomprehensible questions in our faces. We went to Uragaha two nights in a row. The first night Samson, Stefani, Martin and Matteo accompanied me, the second night only me and Martin and we spent the complete night at the ritual place. We first arrived to a Hinduist temple: a large room with some carpets on the floor where around 30-40 people, (majority of them women) where waiting for the Puja (prayer/ceremony/offering). Connected to the large room two smaller rooms, one contained a Hindu altar with a multitude of gods and fruit offerings and the other a Buddha statue. Drum and bell sounds accompanied the entrance of the priest who danced and sang dressed in a colourful costume that reminded me of the white clown in the European circus tradition. During the ceremony two women started to dance and to shake their heads quite violently. After a while the priest called them and spoke/sang to them putting one hand on their heads. Later they and other participants enter into the altar room carrying fruits basked on their head. 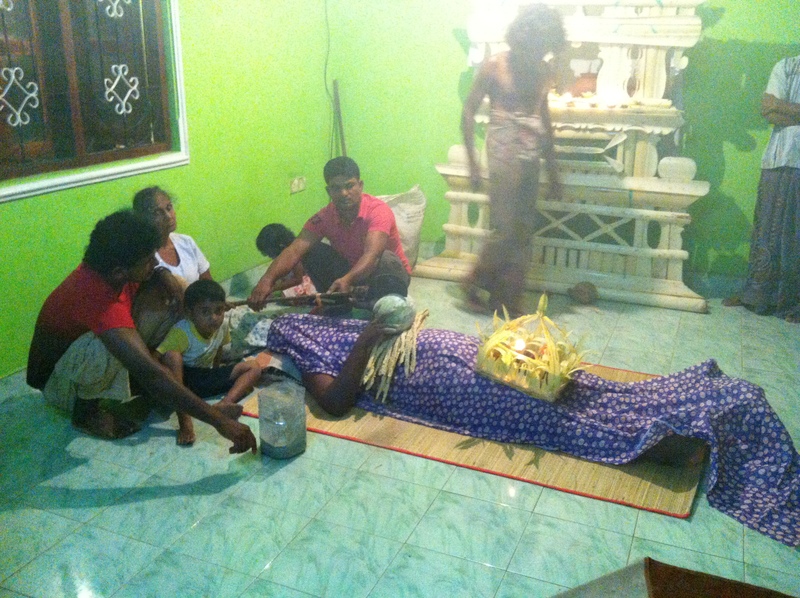 We had been told that one of these women was possessed by the spirits of her mother, that the priest was talking to the spirit, and that she had to give offerings every Saturday for two month in order to “cut the lemon” that if we understood it right meant get liberated from the spirit influence. A pause took place in the ceremony and we understood that this was not a tovil but a puja and that a tovil was taking place at that same moment in a private house not far from there in the countryside. We went to this second location quite deep in to the countryside (jungle). 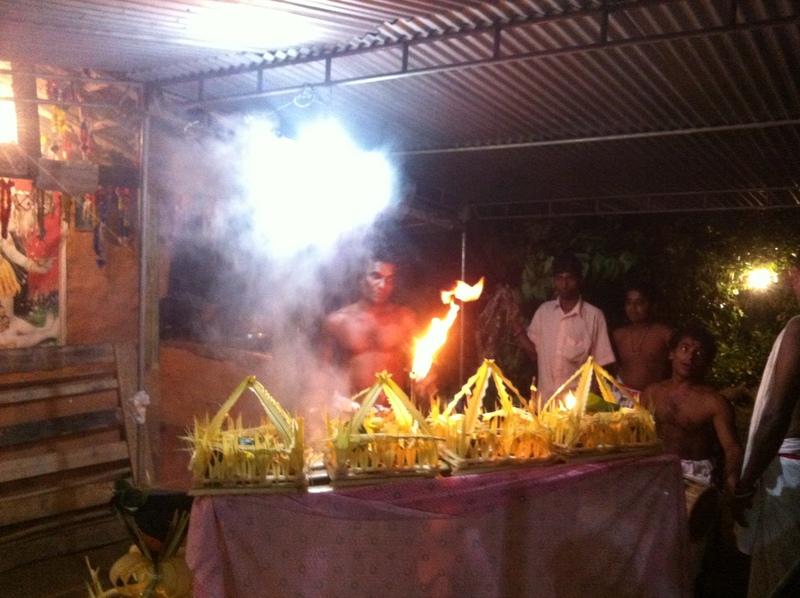 We where very kindly received by the family, neighbours and friends, and we assisted with the ceremony that took place around wonderful altars made of fresh banana tree fibres. We had been told that a bigger ceremony involving masks was going to happen the day after, and we were invited to come back. The second day only me and Martin went back to the place and assisted at the ritual that was already started some hours before we arrived at 23.00 and finished at 6.30 in the morning. 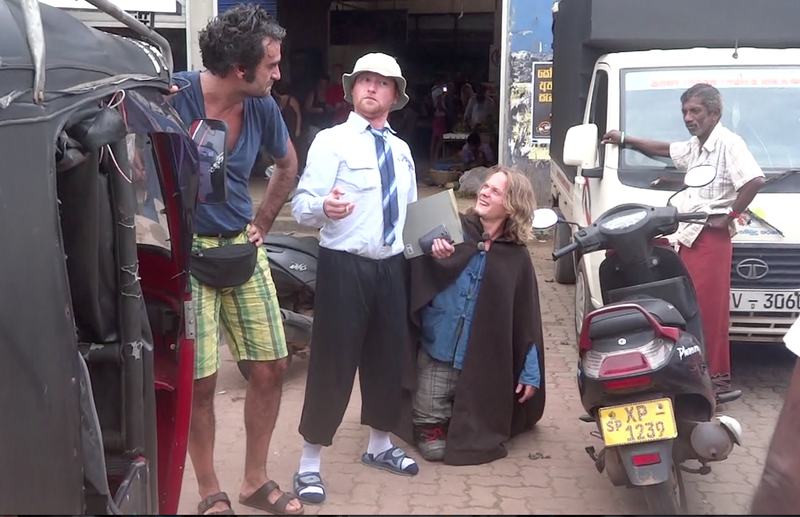 Most of people didn’t speak English and the few persons who did, spoke it very basically. 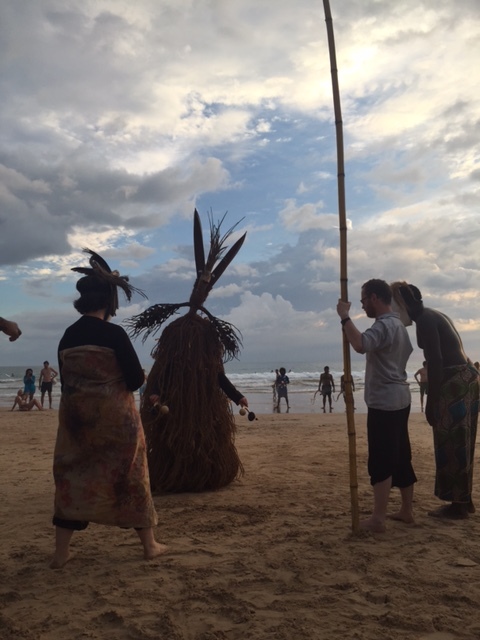 So we were not able to ask complex questions, and the ritual we witness was extremely complex. What I’m writing here is only what I saw and some subjective interpretation or guesses, but the real meaning, symbology and purpose of these ritual acts are stil a mystery to me. I will now report the order of the events as I can remember them (this will not always be exact). A number of very beautiful altars constructed of natural materials outlined the ritual space between the family house and a small temple with images of Hindu gods and Buddha illuminated by a great net of sort of blinking “Christmas lights”. 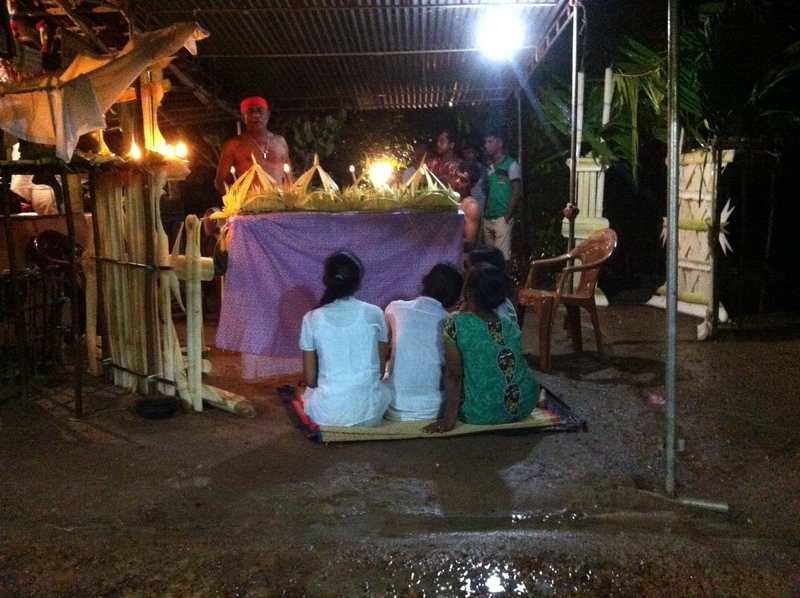 The ritual was held for two young sisters dressed in white, always accompanied by an old lady (their grandmother?). For the whole night they had been sitting on a small carpet on the floor inside the ritual area, and priest, masks and possessed mediums would constantly address to them their actions and words. When we arrived one young woman dressed similarly to the priest we saw the previous day in the Hindu temple was dancing with a sword in her hands. At one point she put down the sword and grabbed a live, black chicken that she shook while dancing. She then rubbed the chicken on the bodies of the young girls and the old lady. When she finished her dance she suddenly became stiff and fell, while two or three men catched her and carried her into the house. 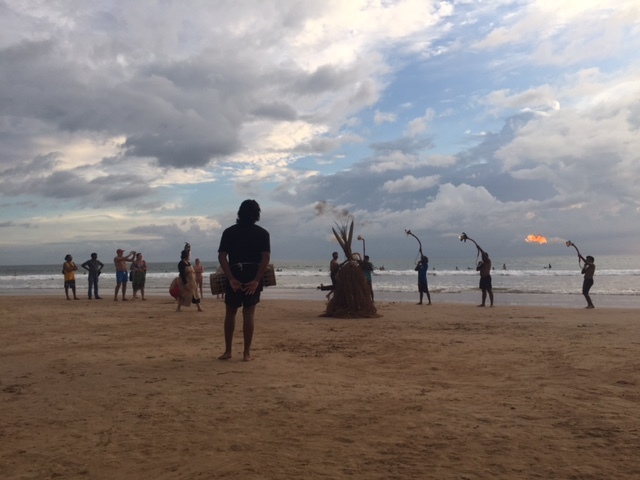 The ceremony continued with different initiates alternating in chanting, dancing and burning a sort of resin powder that produce big spectacular flames. 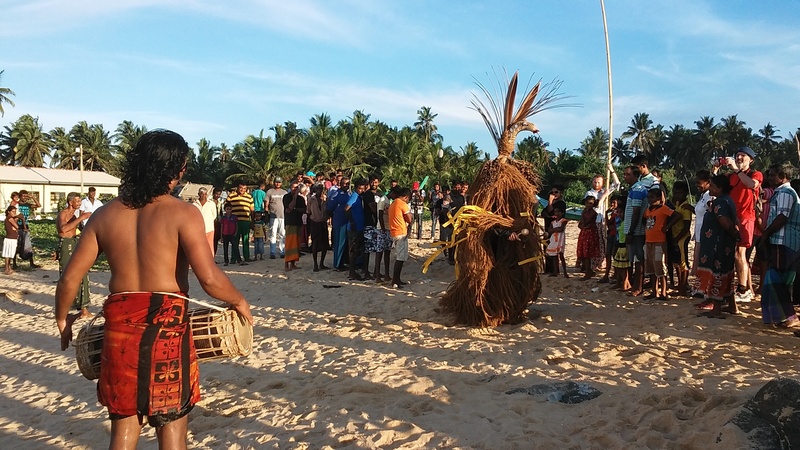 One of the initiates was about 15 years old and he had an impressive control of his dance steps, singing and ritual acts. Different small altars where constructed and filled with food offerings and some coins at different moments through the night to prepare each different phase. The first one had a hairy “black devil face” and a wooden sword in his hand. The second one had a kind of monkey face and was all red, he was holding a strange object made of banana-tree fibres and behaved in a comical way. The third one had a yellow female face and white cloth, she was also behaving buffoon-like. The last one was some sort of black wolf. 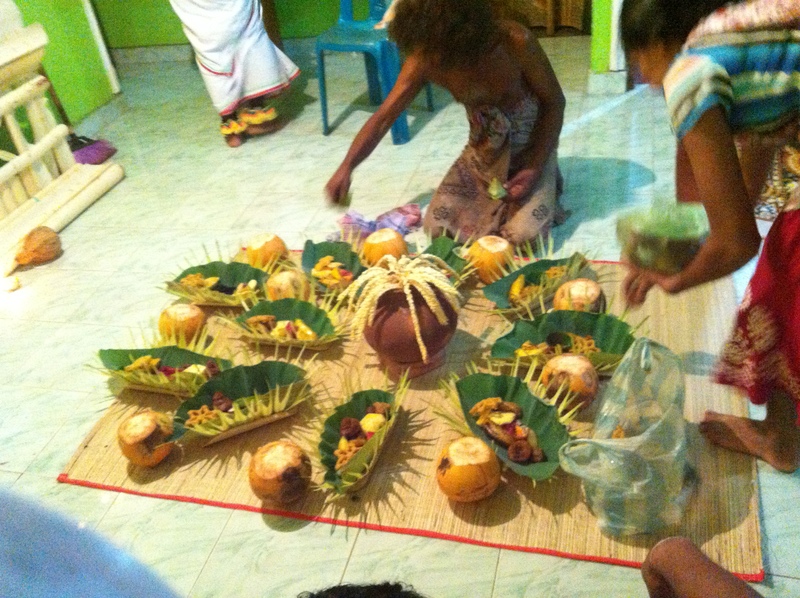 After the four masks had danced and spoken, some more offering was made and some rice with coconut and curry was offered to us. Around 4 a.m. a man made his appearance wearing a costume similar to the woman at the beginning but black instead of red and wearing a helm of yellow natural fibres. He danced with incredible energy and produced big flames with the resin powder. Then he threw the powder on a brazier and closely inhaled the smoke that came out. He repeated the inhalation different times and become extremely wild, a double torch was lit and he held it in his mouth while dancing. With the lit double torch in his mouth and two torches in his hands he performed a very powerful and wild dance and suddenly started to run into the jungle. When he came back he entered the family house and throw fire powder all around. Then he grabbed the chicken and danced with it very violently until he finally rubbed it on the two sisters and the old lady. The intensity of his dancing and the transfigured expression on his face were impressive. At one point he fell down and many initiates came around him trying to get the torch out of his hands and mouth, which he seemed not able to open. After pouring some liquid on his face they finally managed to open his mouth and get the torch out. In that moment he immediately switched to a normal state, looking exhausted and with a radically different presence than just a few seconds before. Then a cage made of natural materials and beautifully decorated started to be constructed. On the bottom of the cage the 15 year old initiate drew in sand a geometrical figure and some letters and then covered this with newspapers and a small carpet. One of the two young sisters in white held a beautiful basket of offerings on her head, two initiates held a blanket above her and they started a small procession crossing multiple times in a circle the altar doors that were facing the jungle. After that the girl sat on a chair in front of the small cage and a drummer started to play just behind her. An initiate chanted and drew with his lighted torches a number of steps that led from the girl to the cage. 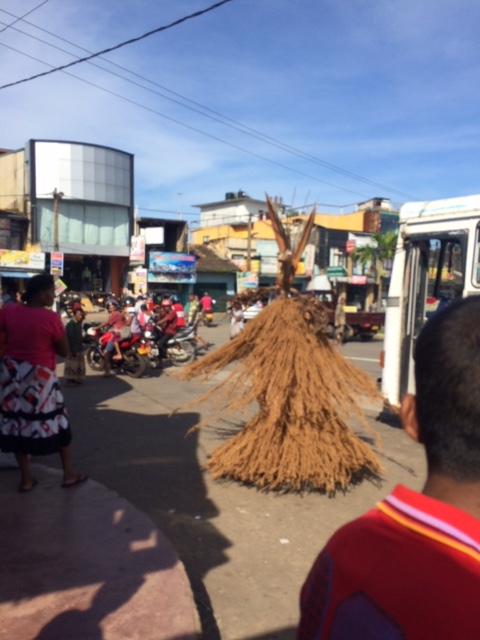 Then each step was adorned with a handcrafted flower made of banana-tree fibre, leaves and coins. The girl stood up and each time she advanced by one-step, one by one the flowers on the steps where removed. When she arrived in front of the cage she opened the door by burning a rope and entered the cage. One initiate sat in front of the cage and while chanting he put a crown on her head and a number of loops around her neck, arms, chest, legs, and feet. The crown and the loops where also made of natural fibres. Then the initiate took a knife and cut the crown and all the loops and one other initiate cut into pieces the cage and freed the girl. Towards the end of the night the young women who was dancing when we arrived got into her costume again and got possessed by an entity whose name I couldn’t retain. She danced powerfully, all the time with her eyes closed and at one point ran into a path in the jungle and lay on the ground not far from some graves. She was ling on the ground and her body was pulsing, shook by a movement that started from her hips. One chicken was positioned between her feet and she was covered with a blanket. Then a huge eggshaped white fruit that I never seen before was placed on her belly. One of the two sisters got out a sword and with the help of two men cut first a couple of small fruit and then the big one on the belly of the possessed women on the ground. The possessed women then stood up and started to throw fire powder all around including on the poor chicken, and again she ran further away following the path into the jungle. Everybody ran after her carrying the altars and she kept throwing fire powder that would illuminate each time for a second the jungle around us. Finally she sat down on a bridge above a large swamp-like river and when everybody reached her, after a series of groans, she started to talk. I have no idea what she said but the words came out like an uninterrupted river for long time and it seemed to be very important. When the possessed woman finished her speech the altars where thrown into the river. That was the end of the ceremony and it corresponded with the sunrise. After cleaning the space the fruit offering in the temple were shared with all present, including me and Martin. This experience was extremely touching and inspiring for my work. How to link this with my work in a concrete way is not an easy question. This I will explore during the residency and further on. 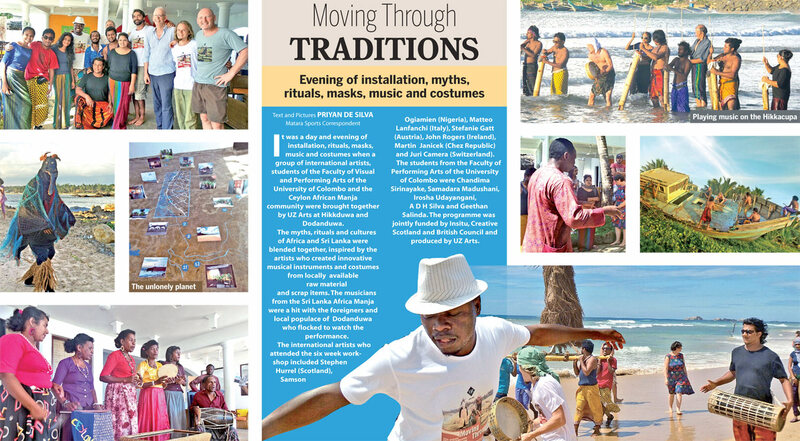 For the moment I will just remark that this ritual included music, dance, theatre, masks, scenography, special effects, audience interaction and displacement, and use of environmental elements. 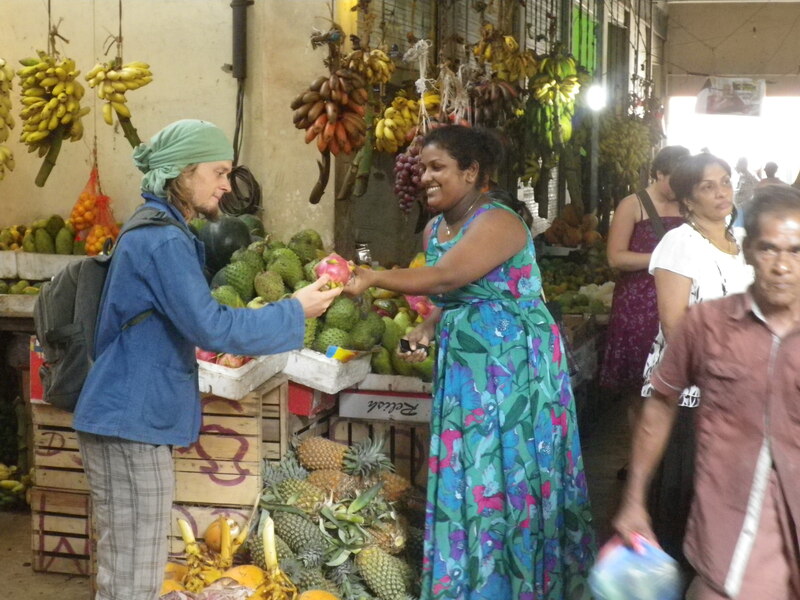 All those ingredients are essential in the practise of art in public space. The spiritual purposes of this ritual need yet to be understood on a deeper level. But maybe the same can be said of art in public space. 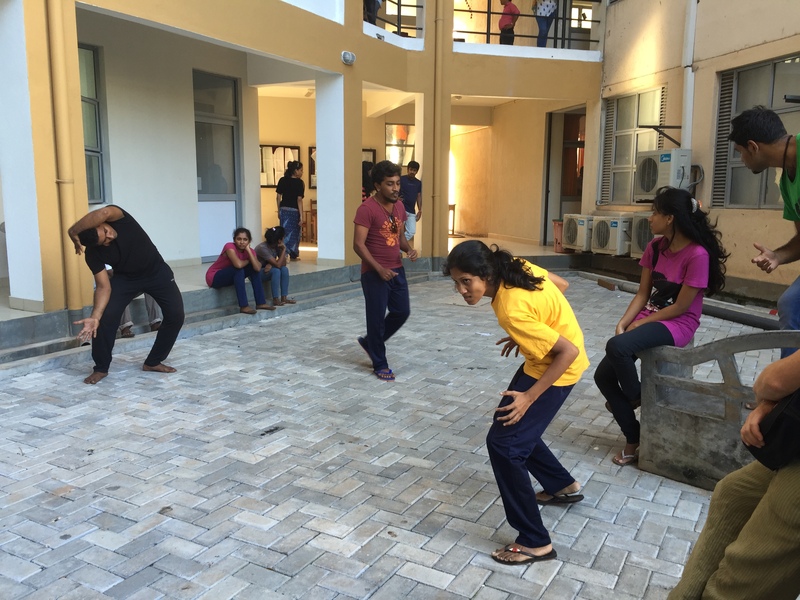 After each participant at the Suramedura residency gave a lecture about their artistic approach, a two days workshop was organized for a large group of performing arts students. The workshop was proposed and leaded by Matteo Lanfranchi. John Rogers and I assisted Matteo before splitting the group (36 students) in three smaller groups, each one led by one of us. The theatrical exercise Matteo proposed is based on the link between emotional memories and space. He proposed the student create a series of little performances in the university space evoking memories of events that really took place in their university life. I focused my contribution to the workshop on the use of the existing architecture as a dramaturgical element and the displacement of the audience. The students were fantastic, very enthusiastic and open to any new inputs. 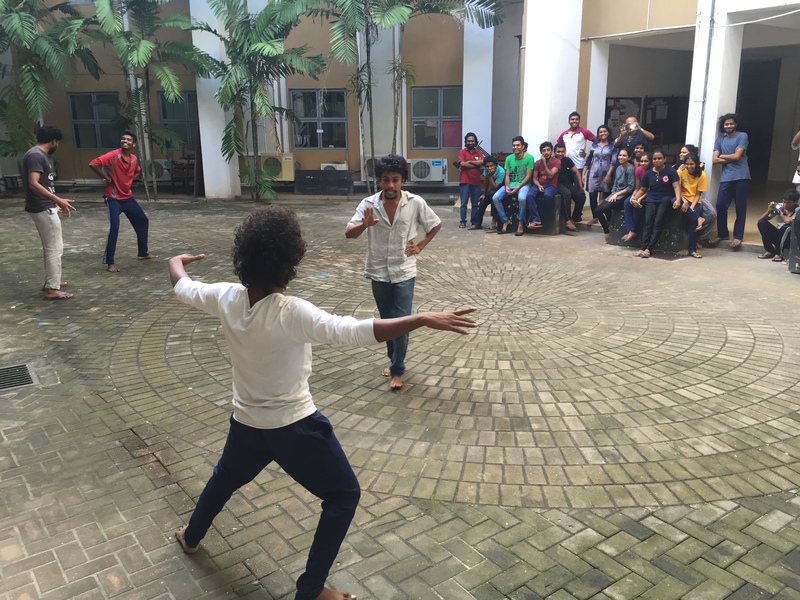 We had very exiting feedback from some of the students some weeks later: a site specific theatre and dance project has been created spontaneously by a group of students after our workshop… that is the most gratifying feedback we could hope for! 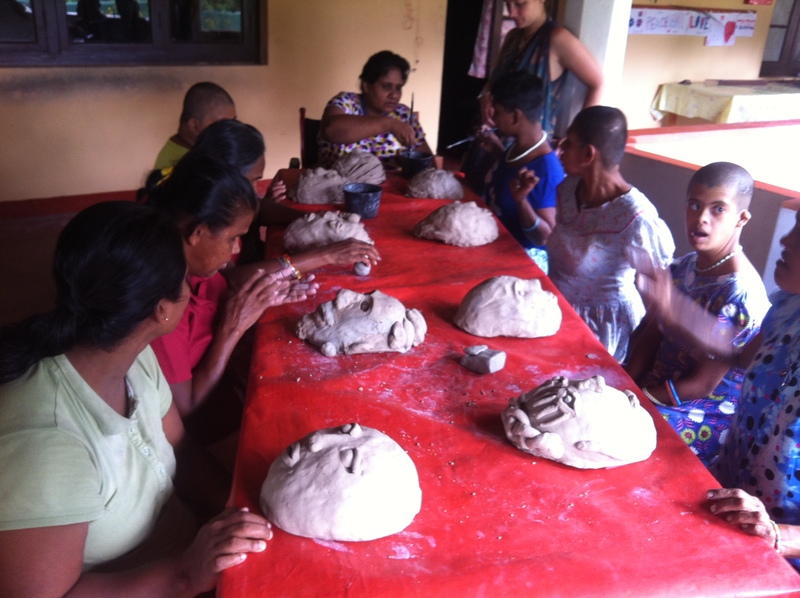 By coincidence I discover a small foundation a few kilometres from Hikkaduwa that hosts about 30 women with different disabilities. I have been asked if I wanted to do an artistic intervention at their location and I proposed to Stephanie Oettl and Samson Ogiamien to hold their mask construction there. In addition I would perform a short music concert. With John and Matteo we helped Samson and Stephanie to hold their workshop. This was a very beautiful and touching experience. 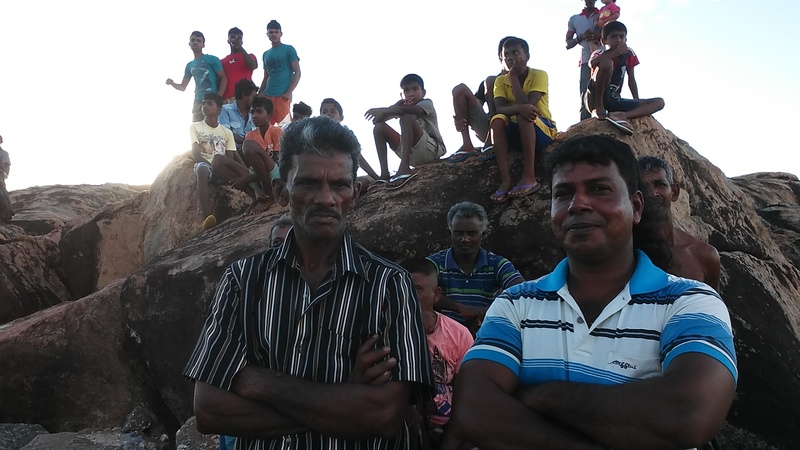 The community responded wonderfully and we felt a very peaceful atmosphere in their home. 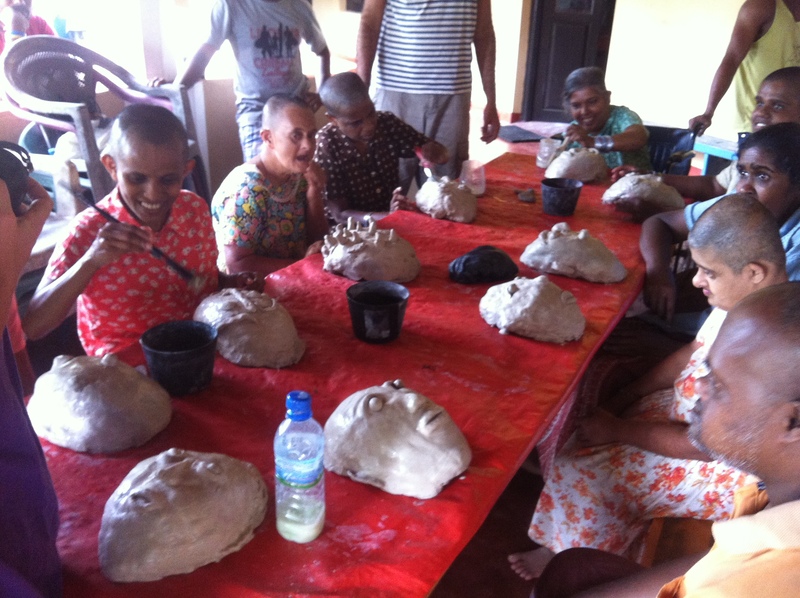 About 20 plaster masks were created by participants who had very different disabilities. Those masks will become a part of Samson’s and Stephanie’s exhibition. I find the masks very beautiful and expressive. Each one has an essense of the person who created it. I had the opportunity to witness one more tovil not far from Uragaha. Again an amazing all-night long aesthetic/ecstatic experience. The tovil was performed by the same exorcist/healer/artist troupe of the previous one but this time it was more calm. There were no possession nor masks involved but it consisted of amazing altar constructions, offerings, chanting, drumming and ritual acts. 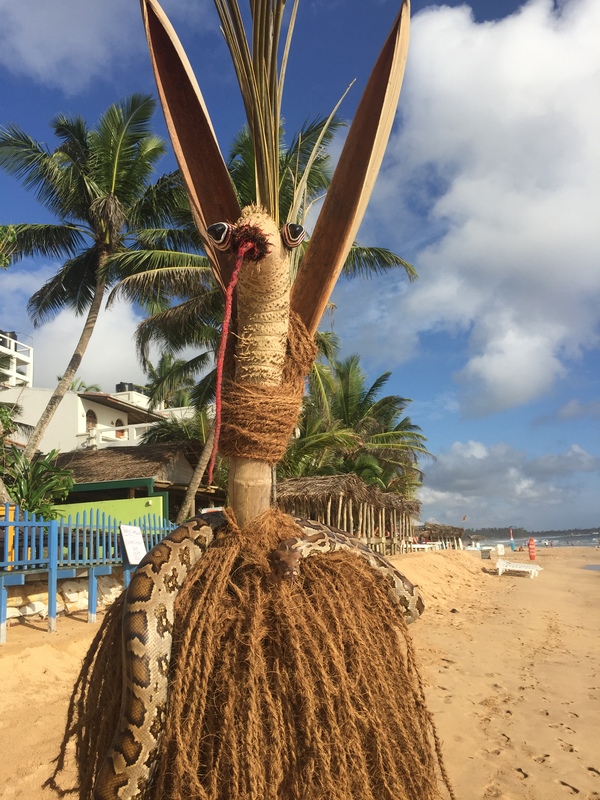 LANU YAKA (the coconut rope demon) is born! 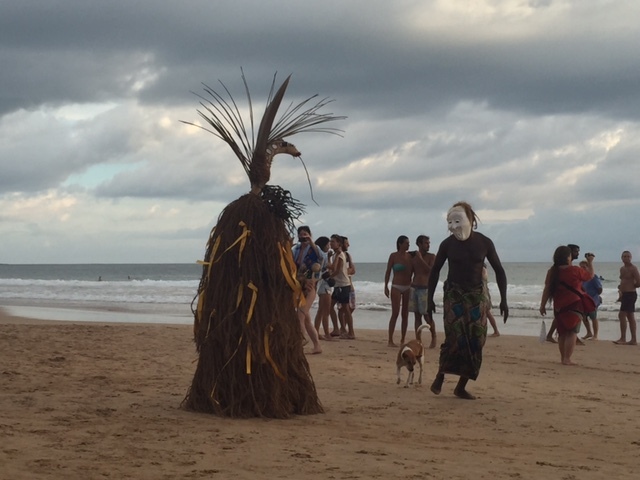 His body is made of one kilometre of coconut rope and his spirit is still hidden in the ocean. 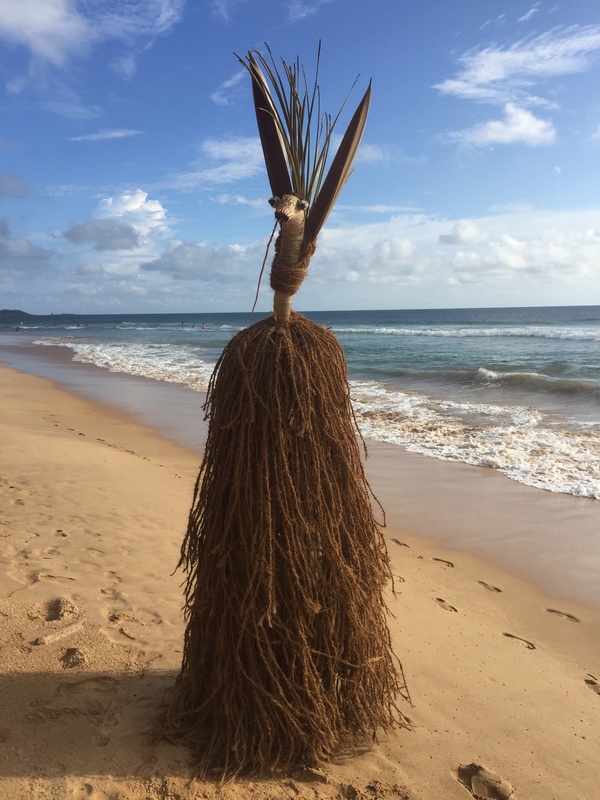 The mask is freely inspired by the magic/mythical dimension of Tovil rituals and the natural elements and texture surrounding me in Hikkaduwa. 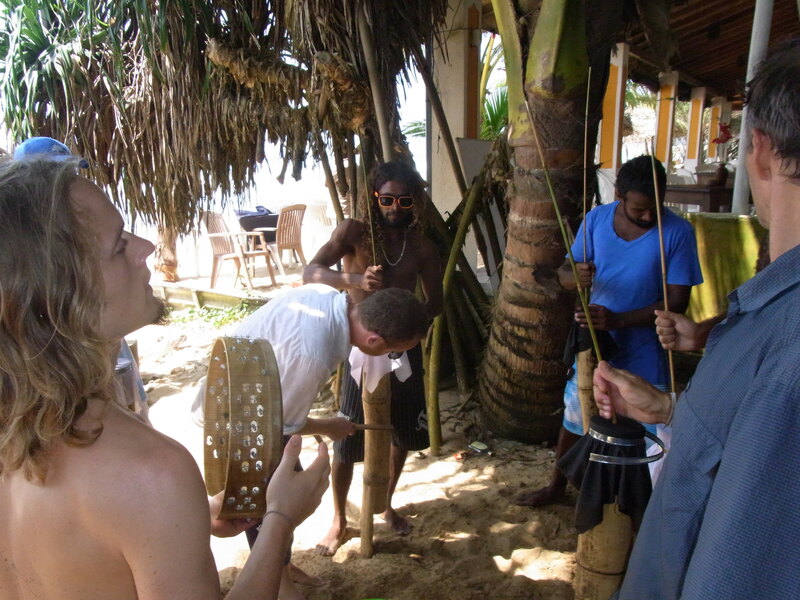 The HIKKAKUPAS are friction drums created with an Italian technic, Sri Lankan Bamboo, Taiwan screws and constructed by a Swiss artist. They sound very good with Nigerian songs! 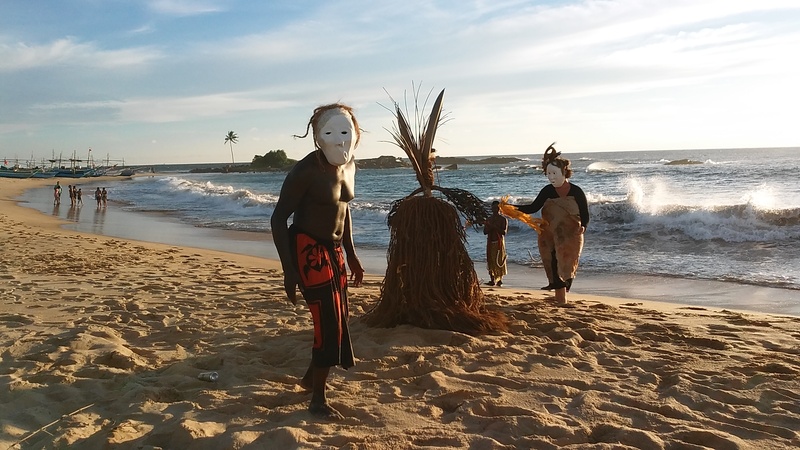 The LANU YAKA mask and the HIKKAKUPA are the two main elements I’ll use in my final performance and in the collective one in Hikkaduwa and Dadanduwa. 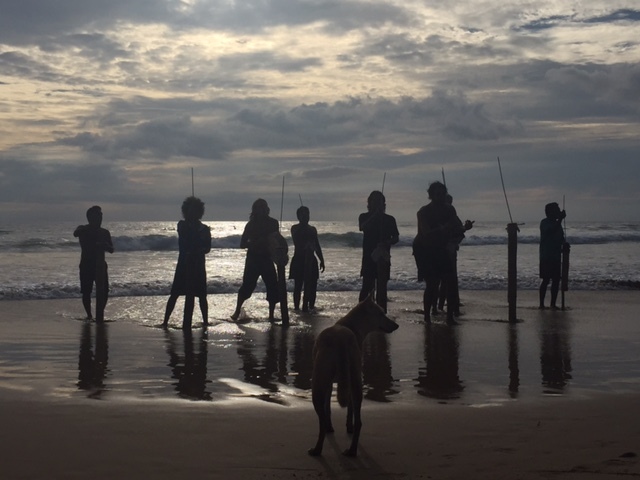 I have built 11 Hikkakupas in order to set up a little orchestra who will perform in the water, where the lagoon meets the ocean. 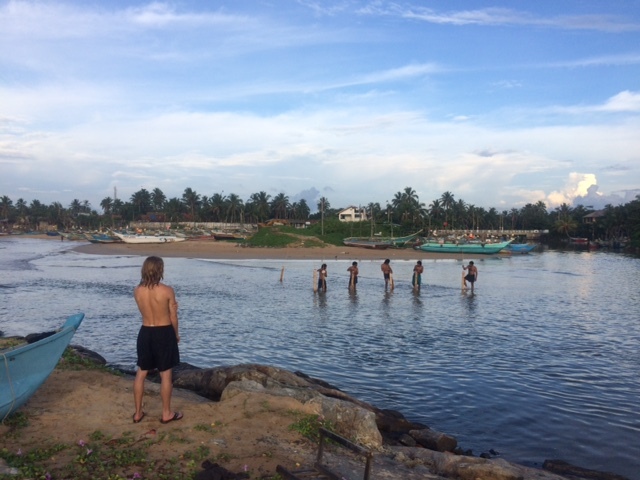 I’m involving a group of performing arts students from Colombo, some local surfers, and a number of children from Dodanduwa (the fisherman village where we will perform) to play in the orchestra. 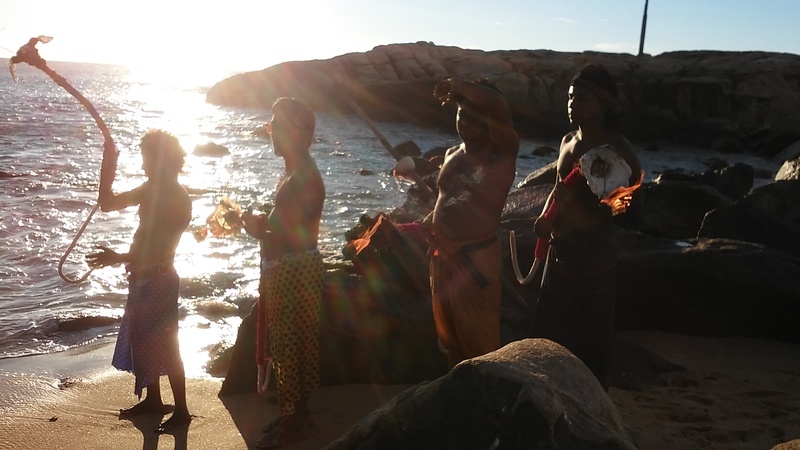 The Hikkakupas only produce sound when in contact with water, so please join the orchestra on the foreshore and we’ll maybe get the spirit of Lanu Yaka to dance for us! 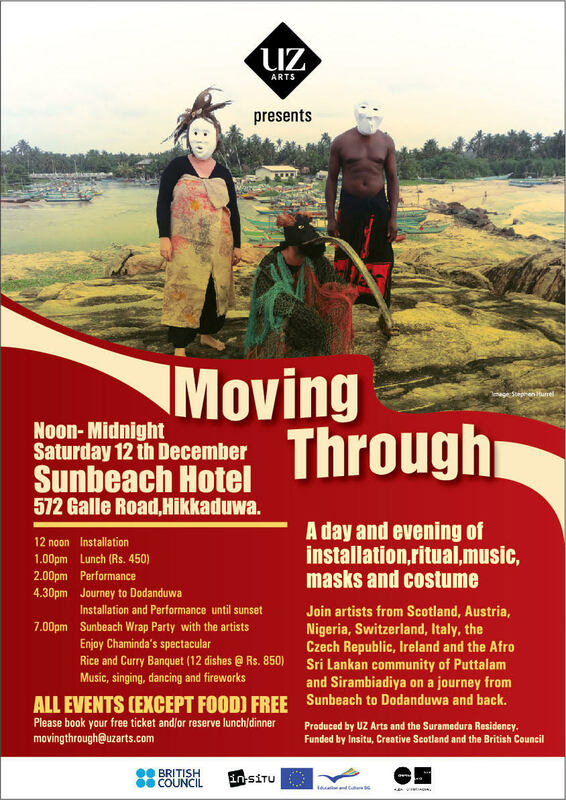 Moving Through is a collective site-responsive performance engaging with the fishing community of Dodanduwa that utilises masks, ritual, installation, music, costume and audience-participation. 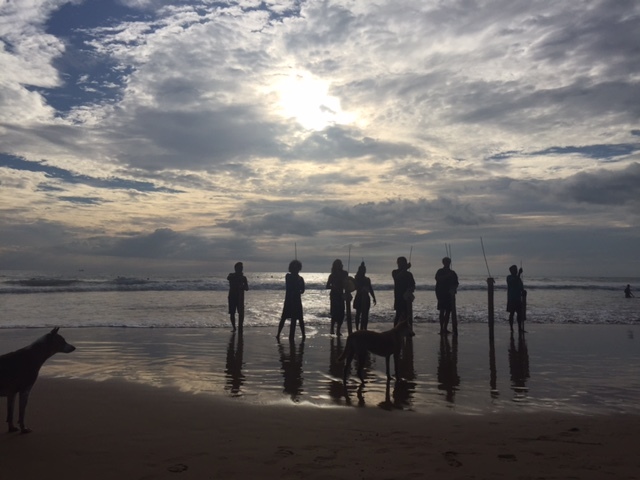 By inviting the audience on a journey through the fishermen’s environment, the artists offer an alternative experience of this already atmospheric location where the lagoon meets the ocean. Each encounter along the way becomes an active strand that ultimately interweaves into a collective net. The seven international artists have been developing individual projects as well as this ensemble performance. 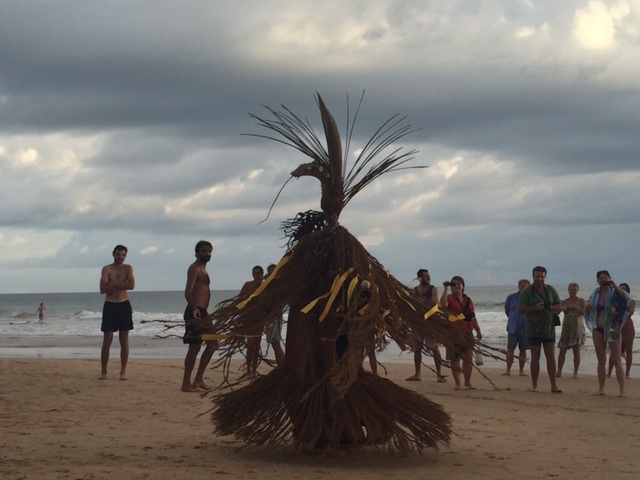 The event starts with an installation of this work at Sunbeach Hotel before moving on to nearby Dodanduwa. Here islink to a short film of the event, many thanks to Tamara Whittle and Douglas Kahan that were shooting during Moving Through. They have truely capture the atmosphere and magic of the event. Thanks!